2 weeks ago, I attended the Unleash the Power Within Seminar conducted by Tony Robbins and was introduced a movie character named Rocky Balboa during the seminar. I have heard of the name Rocky before I attend the seminar but I did not really bother to find the movie. I nearly forgot to find the movie until last week when I saw a blog post by one of my mentor, Anik Singal that caught my attention once again to go find the movie. 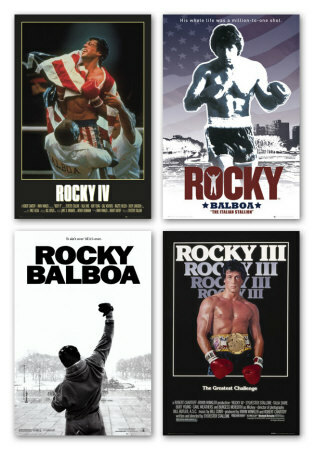 Luckily, my colleague had the whole series of Rocky Balboa from I to VI and I borrowed the movies from him to watch it. Manz, it’s a great movie that I think whoever wants to learn about life and facing fear must watch it. I will be sharing with you the top 10 inspiring quotes that I love from Rocky Balboa movies and hope you can learn something from them too. 1. Rocky Balboa VI: Then the time come for you to be your own man and take on the world, and you did. But somewhere along the line, you changed. You stopped being you. You let people stick a finger in your face and tell you you’re no good. And when things got hard, you started looking for something to blame, like a big shadow. Let me tell you something you already know. The world ain’t all sunshine and rainbows. It’s a very mean and nasty place and I don’t care how tough you are it will beat you to your knees and keep you there permanently if you let it. You, me, or nobody is gonna hit as hard as life. But it ain’t about how hard ya hit. It’s about how hard you can get it and keep moving forward. How much you can take and keep moving forward. That’s how winning is done! Now if you know what you’re worth then go out and get what you’re worth. But ya gotta be willing to take the hits, and not pointing fingers saying you ain’t where you wanna be because of him, or her, or anybody! Cowards do that and that ain’t you! You’re better than that! 2. Mayor (Rocky III): Thank you. Thank you, One and all. Every once in a while a person comes along who defies the odds, who defies logic, and fulfills an incredible dream. 3. Rocky III: Nobody owes nobody nothin’. You owe yourself. 4. Rocky III: All you had to do was ask. 5. Duke (Rocky IV): You’re gonna have to go through hell, worse than any nightmare you’ve ever dreamed. But when it’s over, I know you’ll be the one standing. You know what you have to do. Do it. 6. Rocky IV: Going in one more round when you don’t think you can – that’s what makes all the difference in your life. 7. Rocky IV: I guess what I’m trying to say is, if I can change, and you can change, everybody can change. 8. Mickey Flashback (Rocky V): And nature is smarter than people think. Little by little, we lose our friends, we lose everything. We keep losing and losing till we say, you know, “What the hell am I livin’ around here for? I got no reason to go on.” But with you, kid, boy, I got a reason to go on. And I’m gonna stay alive, and I will watch you make good. 10. Rocky Balboa VI: I appreciate that, but maybe you’re looking out for your interests just a little bit more. I mean you shouldn’t be asking people to come down here and pay the freight on something they paid, it still ain’t good enough, I mean you think that’s right? I mean maybe you’re doing your job but why you gotta stop me from doing mine? Cause if you’re willing to go through all the battling you got to go through to get where you want to get, who’s got the right to stop you? I mean maybe some of you guys got something you never finished, something you really want to do, something you never said to someone, something… and you’re told no, even after you paid your dues? Who’s got the right to tell you that, who? Nobody! It’s your right to listen to your gut, it ain’t nobody’s right to say no after you earned the right to be where you want to be and do what you want to do!… You know, the older I get the more things I gotta leave behind, that’s life.